Her immortality has saved her time and time again, but when the last of her royal family dies at her feet, she is next in line to rule a nation on the brink of war. With no formal training on how to be Queen, Haven must rise to the occasion with the help of her best friends, and personal guard, or risk losing everyone she has ever loved. With war to the West, and no escape to the East, the evil tyrant Kadia sets her sights on the six kingdoms. Haven’s neighbors are quick to fall under the swords of Kadia’s shadow soldiers, leaving a sea of bodies and a clear path to Haven’s only home. As Kadia’s obsession with Haven mounts, little time remains, and Haven must make a choice; join together with her fellow Royals, and test her immortality in a final stand against the evil Queen, or flee across the sea to a foreign republic in hopes of salvation. Both choices have a cost. Both plans could go awry. Haven must decide quickly, or she might be the only one left. 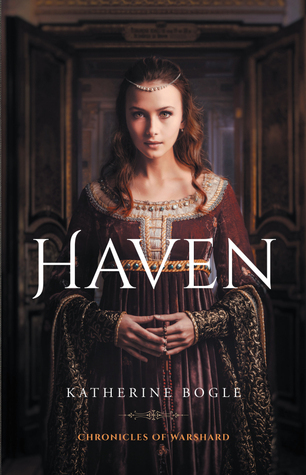 Katherine Bogle's debut young adult novel, Haven, came second in the World's Best Story contest 2015. She currently resides in Saint John, New Brunswick with her partner in crime, and plethora of cats. She can be found at www.katherinebogle.com. Having the chance to be able to dive into this book again was fab! I really cant wait to pick up book two and im so glad that I already have it. This is one that I die hard loved the characters, story, and the world that Bogle has created will make you swoon! I really love Haven the queen who is not scared to put herself in the line of fire since of course she cant die. She can be harmed but she cant die. This alone make this book so good! Toss in the side characters the story and the setting and man o man you wont be able to put this one down. I know I couldnt. This is one that is still on my list of books I so SO want in signed copy! !